The French Roast was carefully roasted for you by Verve Coffee Roasters. As the season progresses, Verve uses different selections from Central America to make up their French Roast. These coffees are dense, balanced and allow them to turn up the heat a bit. This coffee is bold with smoky and caramel notes. I did not like this French roast at all. It wasn't very dark, off-putting to my palate. I prefer not to have this one again. Very good.. Not particularly bold. It took 4 heaping tablespoons in my French press just so I could get it to my taste. But it does have some complex flavors going on which is why I gave it a 4 star. My favorite so far. Consistently smooth and balanced. My boyfriend (who insists all coffee tastes the same) picked up the difference right away. I can drink this coffee but I still taste a hint of acidity and a little floral which aren't my favorite coffee attributes. Very light for a supposed "French roast". Beans seemed dried out, no visible oils. Drinkable, but really expected something darker and bolder. Coffee is good, but not what I expected of a French Roast. It more closely resembles a light roast. The beans are relatively light-colored, non-oily, and a bit tough to grind. The taste is on the bright and sweet side. I definitely notice the chocolate notes, but not so much the smoky. I enjoyed the cup, but again, i was expecting something more traditionalkg dark. Good; not great but I enjoyed it and appreciated its intricacies when compared to other coffees. This is my favorite so far. Just the right balance of chocolaty deliciousness with some other (hard for me to name) flavor notes. Worked really well with milk. A decent coffee, but a bit boring. Enjoyed the aroma and flavor of this blend. I did not like this one as much. It has good balance but lacked boldness. I also don't think I care for smokey. Very thin and limited flavor profile. A wuss of a coffee. Not my favorite coffee when compared to my last cup. In terms of a being a dark bold and smoky coffee it was there. When it comes to overall flavor though I missed any notes of caramel or brown sugar as described. Like I said before my last coffee by Huckleberry was by far more superb. I really like this one, its a good roast and super smooth. Its dark enough for me but not too dark for my husband, a really good balance for the both of us. Very smooth coffee, love the taste! Great French Roast, even though I usually prefer darker roasts. I like this roast. I'm not sure if I like it better than the last roast though. The caramel notes are good, and I enjoy it, but caramel is probably a flavor I wouldn't necessarily choose. I made this roast in a variety of ways and it was good every way. Decent. Not my favorite but still drinkable. Both of us enjoyed this bean. STOP SENDING THESE FAKE DARK ROAST COFFEES!! This is the second one, both labeled as a dark roast and both came looking very light brown and taste just like a light roast. Yes it has smoky notes and very light caramel tones, but it is not bold and certainly not dark. It gets 1 star in the hopes you will actually send me a dark roasted bag of coffee. just OK on this one. Maybe I need to play with the settings on the espresso machine, but I was never able to get a lot of boldness on this one, compared to others. It's good but doesn't fit my profile. I like darker roasts. 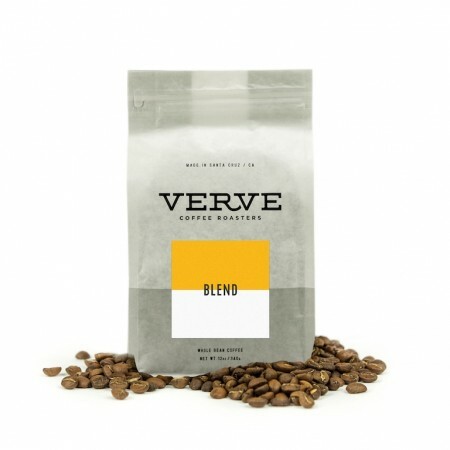 Verve is one of my favorites when dark roasted. very good flavor. I liked the intensity. Better than the first 2. Not sure how to tweak this more. Maybe this degree of boldness but a little more mellow? OR, just let me try something similar. Really smooth, this a really great tasting roast! Enjoyed how it was less smoky than the previous blend. Nice hint of caramel! I felt that the French Roast by Verve Coffee Roasters was a great coffee overall, but it had a little more of a sour after taste than the previous coffee (Radio Wave Organic Blend by Kickapoo Roasters). If had to choose between the two, I would most likely prefer the Radio Wave Blend over the French Roast. I felt that the French Roast has a little less body than the Blend. I did enjoy the scent of the French Roast beans. It was also great to learn about a new roaster that is from my area (Santa Cruz is about 40 mins by car away from where I currently live). Exceptional flavor, smoothness, and complexity. Not as dark and full of flavor I would normally expect from a French Roast. not crazy about French roast. it's too roasted for my taste. Nothing special but a decent light cup. My batch didn't seem to be as darkly roasted as I'd expected. I couldn't pick up much coffee flavor when drinking this, and it unfortunately tasted like water to me on most days. Maybe it's just my tastebuds, but at least it tasted "clean". Has a rich flavor but a very metallic tone as well. I prefer less of a metallic taste in my cup. Amazing! Full of rich coffee flavor but without any harsh acidic notes. Very tasty! Perfect cup! Coffee is weak. The caramel tones come through, but taste burnt. Chocolatey, but not as smoky as I'd like. I was forced to keep the grind pretty coarse to avoid the metallic flavor that is all too common with coffees from South and Central America. Loved this one. Deep, rich taste. Pretty basic. Not a huge fan of French roast as it's usually better with Half and Half. Like this one only because it's not very oily. Would prefer to not have one like this shipped again. This coffee wasn't for me. The description sounded great, but there was an aftertaste that my girlfriend and I did not like. Good, not great. Usually I put the barest amount of skim milk to take an "edge" off of coffee, but went just black when trying this and it just doesn't have a rich, robust taste like I'd expect from a French Roast. Solid flavor that stood out more when I made drip coffee. This is an excellent brew. Smooth and bold and the hint of brown sugar taste makes this unique. A nice balance balance between a medium and a dark roast. Another spectacular roast from Verve. Enjoy this roast very much. Different than what i would usually get but i really liked this one! Tasty french roast. Quite bold, perhaps a little too smoky for my tastes. Still very good. Very good! A tad bit more acidic than I love but very tasty. Thanks! Good flavor that's slightly bitter for my preference ( to be expected from a dark French roast). The coffee flavor of these beans were a little better than the last beans we got, but the overall flavor was marred by sour notes. I have to edit the review on this one. I've really grown to love the bold rich flavor of this one. This has become a favorite here. Would certainly buy this one again! Yuuuuuuuuum! The bolder, the better! Love this coffee! Smoky and dark with a subtle, sweet undertone. This was a good coffee, but I preferred the Goat Rock blend over this one. This one was probably a little too caramelly in flavor for my liking though it is growing on me with each brew! I guess I like the deeper darker chocolate type notes in my coffee vs the lighter caramel mid tones. Really like this. Balanced and full-bodied. Good stuff. This was a big hit at our house hold. Hoping for more like this in the future. Not bad, better than average. I'd be happy if I'd get this quality at a restaurant or a friends house. But since I've tasted much better at home I wouldn't buy.Cold brewed with a toddy. This coffee has a slight bitter aftertaste when black, although you can detect the caramel undertone if you try. With a bit of cream added, the flavor seems to be balanced out and makes for a delicious cup. Just okay - not as dark as I thought it would be by the description! This coffee was good, but didn't amaze us. I want to say though that it wasn't bad coffee at all. We gave it 3 stars simply because so many of the coffees we have tried from our subscription have been over the top amazing! I thought that this coffee would be too strong since it was a french roast, but I wrong. This was really great on the French press but even better on my pour over. The beans were super fresh so the bloom was really foamy. The smokey notes and caramel flavors really came came through especially after adding a little cream. I really liked this one. A good balance between the caramel and smoky, roasted flavors that's neither too strong nor too light. I shared this with a friend, and he loved it. The coffee was ok. Honestly I didn't find it to be any more special than what I would find at Safeway where I buy my groceries. The beans were dryer and less oily than I would like. I'm willing to sacrifice some caffeine for beans that are bit oilier and have deeper and richer taste. Can taste the smoke but just didn't care for it as much as the others we have had. French roasts aren't our favorite. Probably my favorite from mistobox to date. Excellent,, rich flavor. Perfect combination of flavors. Love it! Strong, well balanced, delicious on its own but holds up well to quite a bit of milk. Excellent with warmed raw milk! We like this one. Love the dark roast. I have found I do not like french roasts as they do not have much flavor by themselves. I don't like adding anything to my coffee and this seemed it required a creamer or sugar to fully enjoy. The deeper I got into this bag the more I liked it. A much different, but still quite welcomed, change from the La Colombe roast. Thanks for your picks! Not bad but a bit tangy for my taste. OK, but don't really like the taste of this coffee - almost has a sour kind of flavor. Delicious and rich, but still mellow. I did not really like this coffee. I thought it was weak and a bit bland. Definitely not my favorite shipment from Mistobox. It's a perfectly fine coffee, but just didn't wow me. No complaints, it's still tasty, but just not my favorite. This coffee was too nutty for me. It was a five out of five for what I asked for (something nutty). I just thought that one flavor was overwhelming. I'd prefer something a little darker. Fantastic cup. Complex notes that I am still trying to work through.. Wonderful. Probably my favorite so far. Bold, rich flavor with a hint of sweetness. Overall a solid coffee. Nothing really stood out to me, but was nice. The best roast out of my first shipment. Surprisingly little aroma, but really distinct taste. It has a sort of muffled acidity; you can't feel the tingling on the sides of your tongue, but the taste that accompanies that feeling is there. Makes a great press and espresso. The flavor was smooth and bold but a little too bitter for me. Thankfully I had guests that thoroughly enjoyed it! The beans are medium brown in color, not oily with a slightly sweet smell. I was surprised to see the brewed coffee was inky dark, but found the taste to be on the acidic side. I tend to prefer a bolder, more balanced brew, but enjoyed that this blend was a bit of a adventure to try. This is a pretty good French Roast, not my favorite but still pretty good as a latte. We usually are big fans of Verve beans, as their roasting facility is right down the street from us, but this isn't their best offering. We definitely got the smokey flavors, but other than that unique anecdote, it was alright at best. If you know of anyone else with a similar taste profile to us, and want to suggest some Verve beans to them, have them try the Sermon or Streetlevel. Strong and balanced. This coffee stands out in a French Press, but loses a bit of complexity in the Chemex. My husband loves this one. We especially liked it in our Toddy cold brew system. This one was right up my alley as far as dark tones and smoky flavors. A great find.